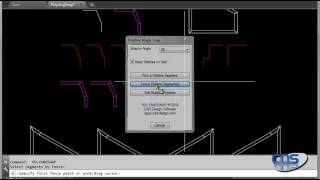 Polyangsnap is yet another design drawing utility from CAD Design Software that is bound to make your life easier! Either single or multiple polylines can be selected in one go, and the user can then easily add a vertex, indicate a direction and snap it to a selected angle. Editing polyline angles has never been easier. Download your trial TODAY!